College students from across the state held a rally in April in front of the Mass. State House to lobby Beacon Hill for legislation aimed at cracking down on campus sexual assault. A measure that would have created a task force to develop such a survey and then required all colleges and universities in the state to put out a version of it to students every two years faltered in the final hours of formal legislative sessions for the year after the House and Senate took different approaches, leaving its prospects murky. “At the end of the day, this legislation is about protecting students, and I’m confident that the momentum we created this session will carry the bill forward, whether it be informal or formal,” Ehrlich told the State House News Service, saying she’d pursue the issue again in the term that begins in January. The bill cleared the House unanimously July 25, six days before the final formal session of the two-year legislative term on July 31, by which point lawmakers try to wrap up major business. The House and Senate will meet in informal sessions for the rest of the year, when any one legislator can block a bill. 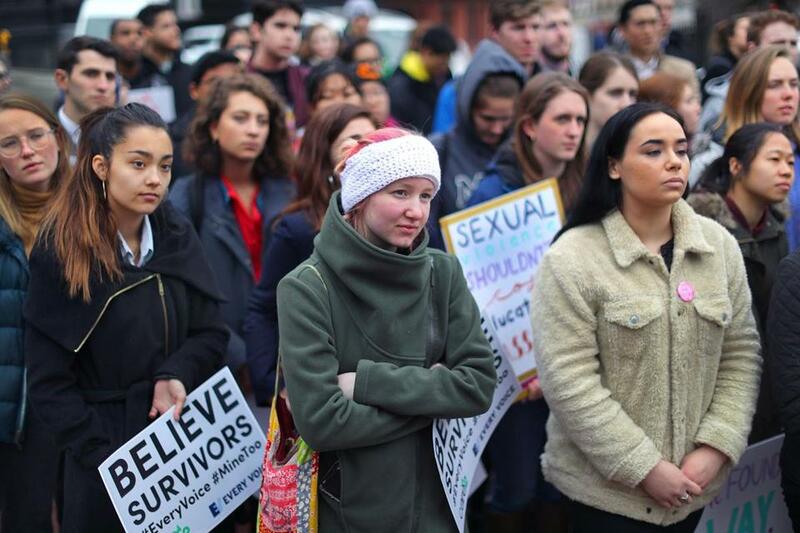 Hundreds gathered at the State House with a message: Massachusetts should not let the Trump administration determine how colleges handle assault allegations. Under the House bill, schools would be required to conduct the sexual misconduct surveys beginning in August 2019, after a task force develops a model survey designed to gather information including the number of reported incidents of sexual misconduct on campus, student awareness of related policies, and what happens after a victim reports sexual misconduct. Ehrlich and Scibak both described the bill as a first step in combating sexual assault on campuses. Moore offered an amendment that added in elements of a broader campus sexual assault bill the Senate passed in November, including requirements that students be trained annually on sexual violence prevention and that each college and university designate a “confidential resource advisor” who can provide students information on reporting options, counseling, and post-assault medical services. A spokeswoman for Speaker Robert DeLeo said the House had “productive conversations with members and advocates” over the past year, and that DeLeo plans to continue those talks. Members of the Every Voice Coalition, which pushed for the survey bill and supports the Senate’s campus sexual assault bill, said they hope a version can pass in an informal session before year’s end, and, if not, they expect it to become law within two to four years. “It’s just about trying to figure out what can we all work toward to find a solution that works for everybody, and hopefully keep pressing on this issue, because it’s not like one bill or one idea is going to solve this incredibly complex problem,” John Gabrieli said. Genevieve Rogers said the coalition has worked with lawmakers, local organizations, and national groups to build support for the survey bill. A highlight, she said, was an April rally that brought more than 200 students from 20 colleges to the State House.